Avoid the crowds on your next vacation, while enjoying spectacular views of Snowbasin Ski Resort and Pineview Reservoir from the great room of this nicely appointed vacation home. Why squeeze into a condo when you can rent this magnificent hillside home situated on 1.6 acres overlooking Ogden Valley. Our home is well-appointed with everything you will need for an enjoyable visit, including a high-speed wireless internet connection for those who need to stay in touch with the latest events at home. 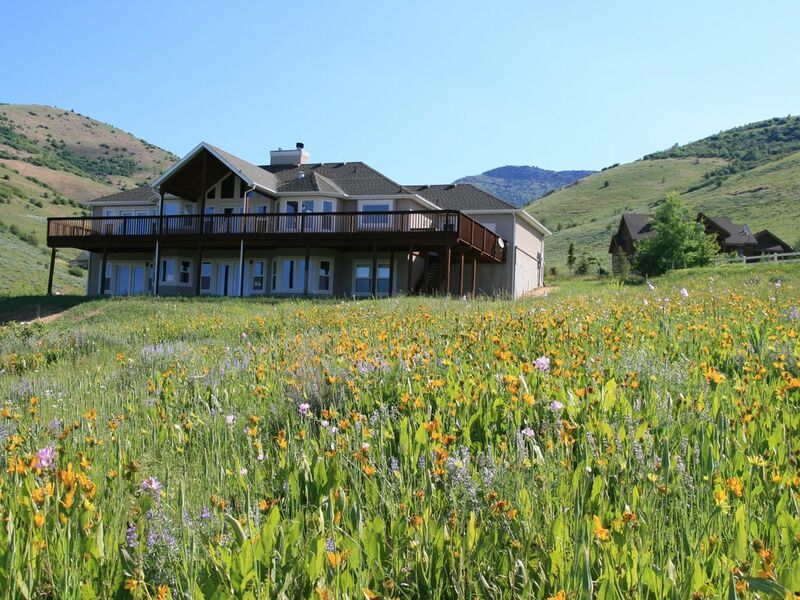 This beautiful home is an easy 15 minute drive to world-class downhill skiing at Snowbasin Ski Resort, home of the 2002 Olympic downhill and superG events, and only 20 minutes to more great powder at Powder Mountain Ski Resort. Cross-country skiing and snowmobiling are also conveniently located nearby. For our fair weather friends, Ogden Valley provides a variety of outdoor recreational activities including hiking, mountain biking, horseback riding, golf, fishing, and a variety of water sports at the adjacent Pineview Reservoir. Ogden Valley has something for everyone! With the Winter Olympics being awarded to Salt Lake City, my brother and I had begun coming to the area to vacation and check it out. We looked into the 'big name' resorts but found them a bit too crowded and overpriced for our taste. We came to love the 'locals only' atmosphere of Snowbasin and Powder Mtn. The subsequent investments made in Snowbasin to bring it to world class Olympic standards are wonderful, yet the lack on slopeside condos keeps the atmosphere just like we want it. We always have a fabulous time when we are at the house and would not want to be anywhere else. toilet, tub, shower, Large comfortable master bath, accessible from the MBR. toilet, combination tub/shower, Hall bath, share by 2 bedrooms. toilet, Off the laundry room. toilet, combination tub/shower, Shared by the downstairs bedrooms. Plenty of space to spread out a little for larger groups. The house has two 40 gallon hot water tanks in series so everyone can recover with a hot shower after a day of skiing! Looks directly out and across Pine View Reservoir! Fabulous in the summer time! Driveway parking only. No parking in the street for neighbors sake! Two large great rooms, one upstairs and one downstairs. Plenty of room to spread out or to let some folks wind down and others live it up! Two televisions, with one upstairs and one downstairs. Great property with views of Snowbasin! Great property with beautiful views. Short drive to Snowbasin. Clean and ready to go when we arrived. Would definitely stay here in the future. Great house close to Snowbasin! House is set up perfect for a family. The house had everything we needed to make it the perfect home away from home. Close to Snowbasin and super helpful owner! Highly recommend this home for your stay. Well equipped and comfortable. Jay is very helpful! amazing and peaceful in one place, we will call it home again soon! Sometimes it's hard to please everyone when ages vary so much, however Polo grounds is loved by my 6 year old, the 48 year old(me) and all in between. The inside just flows and the view from the deck is something you have to see! We extended our stay because we just didn't want to leave Polo grounds, Jay is helpful and always responds to his guests. We won't stay anywhere else, cause we found our home away from home but better! Well stocked in a beautiful remote location, this rental home was perfect for our family vacation. There was plenty of room for everyone to spread out, a grass area on a gentle slope in the backyard for the young ones to chase butterflies, and a majestic view off the back patio. The owner was easy to communicate with answering all our questions. We enjoyed our stay and would rent again. Awesome House and Beautiful Location! We loved staying in this home! The home was immaculate and is a great layout for a large group. With living areas on the main floor and the basement, there was plenty of room for us to spread out. All of the beds were comfortable, with large bedrooms throughout. The kids loved the ping pong table and the great selection of board games. The views of Snow Basin and the valley from the deck and back windows are amazing! The pictures don't do it justice! We loved relaxing on the deck in the evening and watching the shadows change in the valley as the sun went down. The location is very quiet and relaxing but not too far from a local grocery store in Eden and about 20 minutes from a larger grocery store in Ogden. We all had fun paddle boarding at Pineview reservoir, playing up at Snowbasin resort, and hiking some of the beautiful trails in the area. The hosts Jay and Ellen were very responsive and provided all the information we needed for a smooth check in, as well as answering questions we had during our stay. They also had lots of great recommendations for local activities. All in all, a great place to stay. We visited in early June and the weather was perfect! I'm sure it would be beautiful for any of the four seasons though. We highly recommend this home and this part of the country! We are open to adding additional days to extend a rental. We would also consider shorter stays under certain circumstances.